Hipster beards have become some of the most sought-after beard styles in recent times. While they offer a great sense of duality and balance, pairing disheveled type beards with sleek hairstyles, they also achieve a great sense of edginess and sexiness. What Makes a Hipster Beard? A hipster beard isn’t exactly a new phenomenon—the only thing that’s different is the name. See, a hipster beard, by nature, has to be full, lush, usually long, and always beautifully groomed. It’s not uncommon for the accompanying mustache to be styled as a handlebar, with perfectly curled ends. Some hipster beards resemble the Bandholz beard or a full beard. Others veer more toward the Garibaldi or the short but still full Verdi. A common style among hipsters is styling a thick, short beard with a short haircut that has been slicked down and parted. This beard is a very classic type of way to stylize even the most disheveled beard since it displays that the beard looks that way on purpose. Be patient as you grow your beard. Nurturing a full, thick beard doesn’t occur overnight. You can’t simply stop shaving for a week and expect a ZZ Top beard. Leave it alone and let it grow. As it does, condition it regularly and moisturize it using an excellent beard oil. As it grows, pay attention to the shape of your face and the way your beard makes it look. Time time, you might need to trim your beard, angle it, or even give your mustache a little twist to better suit the lines and angles of your face. Make sure you keep it neat, as well. Don’t let hair creep over your cheeks and neck. Whether you prefer your beard long or short, you may find a few styles in this list to choose from in order to switch up your look and try something new. 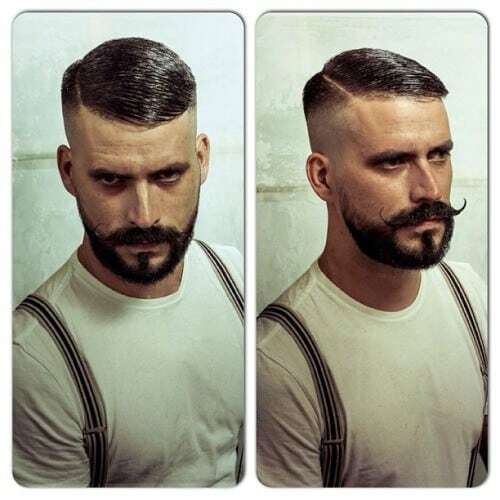 Here are 70 of the hottest hipster beard styles you can copy to get a unique classy look. This is a very polished look, featuring a short beard and a mustache that has been curled up. Pairing this combo with faded temples and hair that has been slicked down gives the look a particularly vintage look that will have you looking like you stepped right out of the 40s. what to do to grow beards more faster? Stop shaving. Other than that, not much. Fast facial hair growth has something to to with testosterone. The more you have, the faster your beard grows. I’ve grown a beard in my late teens and you could hardly see my mustache. Now in my mid 60’s it is thick and fast growing. Not only that it is white. My 84 year old Dad explains these beard trends as Smith Brothers cough drop box guys beard.